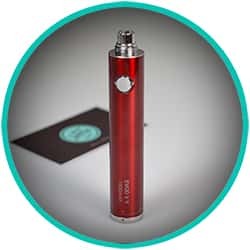 The battery is the device that feeds the coil of the electronic cigarette with electricity. Two important points should be taken into account when choosing a battery: battery life and power, in other words its capacity to produce vapour. A thumb wheel to set the voltage for batteries with a variable voltage. This is a power switch that you press during the total inhalation time. Pressing the button heats the clearomiser coil and leads to vapour being produced. A 510 or eGo/510 connection depending on the model makes it possible to attach the clearomiser or atomiser. Would you like a battery? The battery is the device thats feeds electrical energy to the coil of your electronic cigarette. 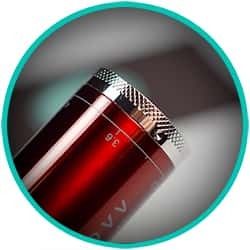 What is the battery of the electronic cigarette composed of ? A rechargeable lithium-ion battery hidden under a protective steel casing equipped with a protection circuit against excessive charges and discharges. A battery life of 300 complete recharges which means a great deal of potential partial recharges (several thousand). A power switch that you press during the total inhalation time. Pressing the button heats the clearomiser coil and leads to vapor being produced. An eGo/510 or 510 depending on the models. Allowing the fixation of the atomiser or the clearomiser. The 510 thread tends to standardise and is therefore rare to find the thread type eGo. A thumbwheel to set the varied voltage. Two important points should be taken into consideration when choosing a battery: The autonomy and power, in other words the capacity to produce a large quantitiy of vapor. Heavy smokers should normally orient towards models of great autonomy which allows thel to generate alot of vapor. 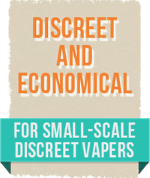 On the other hand, a smoker looking for a scondary system, an electronic cigarette that is going to replace a couple of normal cigarettes, should orient themself towards smaller battery models. Finally, experienced vapers or those who are handy should read the MOD section in the "Experst Corner". Constant or adjustable depending on the model, the voltage value will affect the heating temperature: the higher the voltage, the more the coil of your clearomiser will heat up and the greater the amount of vapor produced. For batteries with constant voltage, the output voltage is 3.7 volts. For batteries with variable voltage, you can change the voltage from 3.3 V to 5.0 V depending on the model. It is defined as the capacity which is expressed in mAh (milliamperes per hour). The capacity ranges from 1000 mAh for the smaller batteries and more than 5000 mAh for the much larger batteries. The size of the battery is correlated to its capacity. In other terms, more capacity of the battery which is larger, more your battery will be bigger. How to evaluate the autonomy of the electronic cigarette? The autonomy of the battery is difficult to determine, as it depends on the frequency and the duration of the inspiration, the voltage, the power and the clearomiser used. To give you an idea of he duration of functioning of the battery in hours, you can divide the capacity by 150, if it is a battery with a fixed voltage and by 200 if it is a battery with varied volatge. How to determine the charge time of a battery? The charge time of a battery depends on the capacity and the rapidity of the charger. The source of enenrgy is also an important factor, as the charge effectutated by sector is much more rapid than via USB (PC) which is often at 1A. With actual batteries, we can consider a charger supplied with a current of 1A (a PC for example) the change will be 1000mA/per hour. Like most Lithium-ion batteries with eGo no screws must be recharged with an adpated charger, delivering an output voltage of 4.2 Volts and intensity of 400mA. To charge your battery, the procedure is the same, no matter which model. Connect the charger to a USB port or mains. Unscrew the clearomiser of the battery. With precaution, carefully screw the battery on the charger where the clearomiser was. The LED of the charger flashes to red, which indicates the charge has started. When the LED turns green, the battery has completed charged. Equipped with a protection system of over-charging, the batteries are disconnecred as soon as they are fully charged. A majority of batteries are eqipped with a pass-through system and can be recharged via a Micro Cable USB. 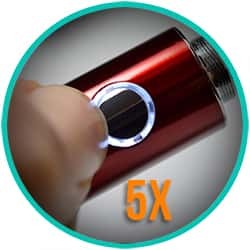 This system means that you do not have to unscrew the clearomiser and allows you to vape during the charge. The charge time is much more rapid with an wall adapter, rather than a PC. Once the charge has finished, the battery disconnects automatically. Will the battery discharge when not in use? 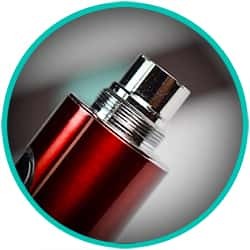 There is no self discharge (less than 10% per year) with the Lithiul-ion which composes the battery of the electronic cigarette. How to activate or deactivate my battery? The lifespan of the battery is estimated at 300 to 500 complete charges. 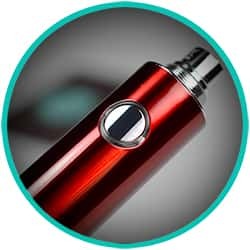 The batterie of the electronic cigarette does not have any memory so therefore you can benefit a lifetime of several thousand partial charges. What if the battery does not charge? In the case of an eGo battery, if good contact is not made, try to raise the plate located on the little round removeable washer fixed at the bottom of the battery screw thread with the help of, for example, the shaft of a ball point pen (becareful not to break it). Charger failure, or batterie at the end of the lifespan (a lithiul-ion type battery) can be completely recharged, approx 300 times. What if the battery flashes rapidly and cuts off although it is fully charged . 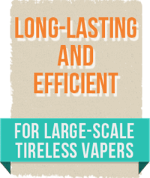 You have used your electronic cigarette too much in a given period of time. The electronic cigarette needs to cool down; you have to wait a few minutes. Remember that the average frequency of inhalation is one draw every 15 or 20 seconds, and the resultant "time at rest" is necessary for the clearomiser coil to cool down. Battery maintenance and how to increase its lifespan? Do not recharge your battery if the ambient temperature is lower than 0°C or higher than 50°C. Do not expose your batteries to temperatures above 80°C. 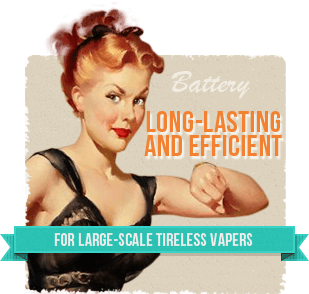 Your electronic cigarette batteries must be used regularly. The more they are used, the more the power will circulate through the battery cells. You should regularly clean all components in contact between the clearomiser and battery. Remember to lock your battery when not in use to prevent accidental discharge. Avoid shocks that could irreversibly damage the battery. Where to dispose of batteries which no longer work ? 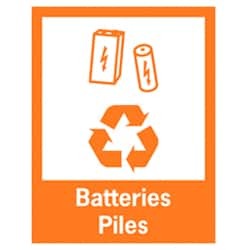 You can dispose of them in containers specially designed for used batteries to facilitate recycling in a special centre. These containers can be found at your hypermarket, tobacconist or recycling centre.